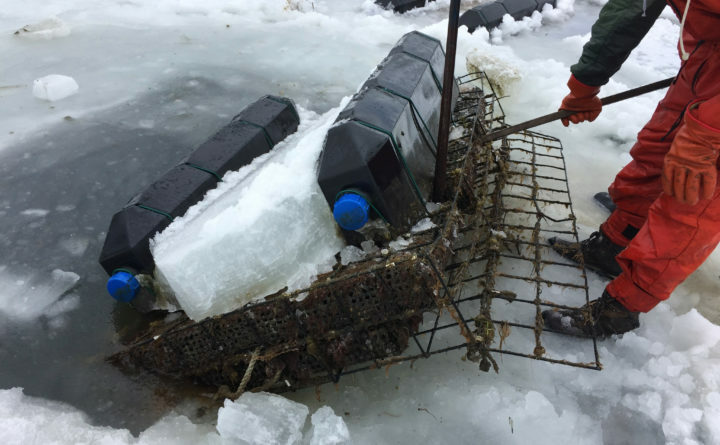 Dan Devereaux of Brunswick, who with Doug Niven owns Mere Point Oyster Company, pulls an ice-covered oyster cage out of Mere Point Bay after cutting through the ice with a chainsaw in this Jan. 11, 2018, file photo. BRUNSWICK, Maine — Now in its third year, Mere Point Oyster Company has seen demand for its product grow faster than expected. This year the company produced 25,000 oysters, which are available only at the Brunswick Farmers Market. But co-owner Dan Devereaux said he’s been approached by chef Sam Hayward of Fore Street Restaurant, as well as Eventide Oyster Co. and The Shop in Portland. So far, Devereaux and his partner, Doug Niven, have invested approximately $250,000 in the project, he said. But in order to meet that demand, the company wants to increase its production, and has applied for a 10-year, 40-acre lease — 750 feet by 2,000 feet — in the subtidal waters of Maquoit Bay, approximately 1,600 feet from Merepoint Neck and more than a mile from the opposite shore of the bay. “We want to be able to produce one and a half million a year,” Devereaux said. According to the duo’s application to the Maine Department of Marine Resources, they plan to reach 1.5 million market oysters by 2021 and “a maximum stocking density” of 5 million oysters by 2023. The lease, like others in adjacent coves, would contain rows of black oyster cages mostly submerged in the water, as well as several floats for working. According to the application submitted to the Department of Marine Resources, the company anticipates employing a full-time farm manager and operations manager, and up to three part-time farmers in 2018, with additional staff in the future. The owners have also discussed providing student employment to science and biology students at Brunswick High School and Bowdoin College. Some opponents have questioned a potential conflict of interest because Devereaux, as the town’s harbormaster, would typically sign off on any lease application. But he said he recused himself from the entire process, Brunswick police Cmdr. Thomas Garrepy and the Maine Marine Patrol assessed the site, and attorneys for the town and Mere Point Oyster Company have assured them there is no conflict. Andy Powers, who lives on Mere Point but not directly on the water, said Monday that a group of roughly 50 homeowners has hired an attorney to represent them in their opposition. The chief objection of the group, now known as the Maquoit Bay Preservation Group, is the size of the proposed project, he said. Powers said lobstermen and fishermen will be affected, as will as ducks and other birds. According to a site report conducted by the Maine Department of Marine Resources in August, the lease would be more than a mile from the western shore of Maquoit Bay, and about 1,160 feet from the nearest point on Merepoint Neck — “adequate room” for owners to navigate on and off their moorings. But the report noted that Merepoint Neck includes 13 docks and boat ramp already, with additional docks north and south of the proposed lease and a mooring field nearby. “The number of docks and moorings, along with the number of lobster buoys located in the southern reaches of the bay, indicate that both commercial and recreational boating activities are commonplace,” the report states. However, some boats traveling across the bay might be forced to alter their traditional path, the DMR concluded. “The proposed lease will be the only obstruction in the area; the single obstruction will not hinder mariners,” Marine Patrol Officer Curtis Labelle wrote in the report. In response to concern from neighbors, and in an effort to educate others about oyster farming, Devereaux has pulled together a panel to speak at Curtis Memorial Library Thursday evening. Meredith White of Mook Sea Farm in Walpole and Chris Vonderweidt of the Gulf of Maine Research Institute will speak about the proposal at 5 p.m.
“We want people to give this idea a fair shake,” Deveraux said. The Department of Marine Resources will hold an administrative public hearing Oct. 18 to consider the lease. The department will accept written comments until Oct. 17.